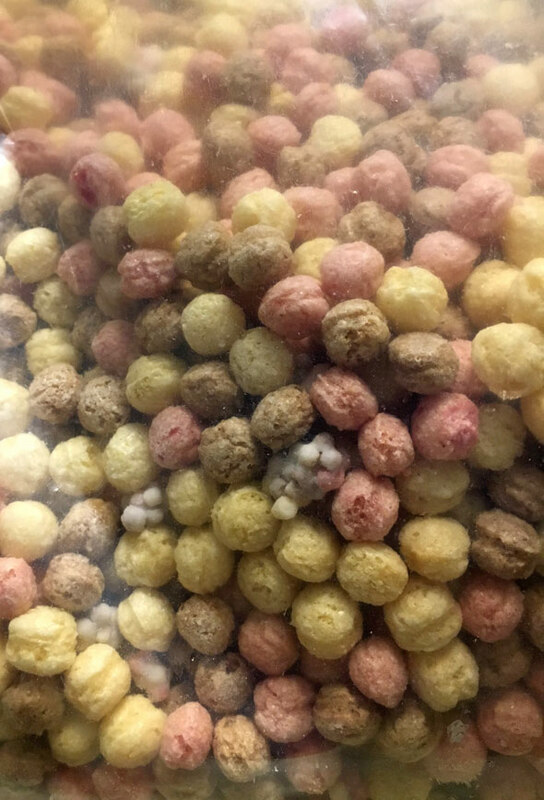 This cereal consists of tan, brown and reddish round pieces roughly the shape of Trix cereal pieces. 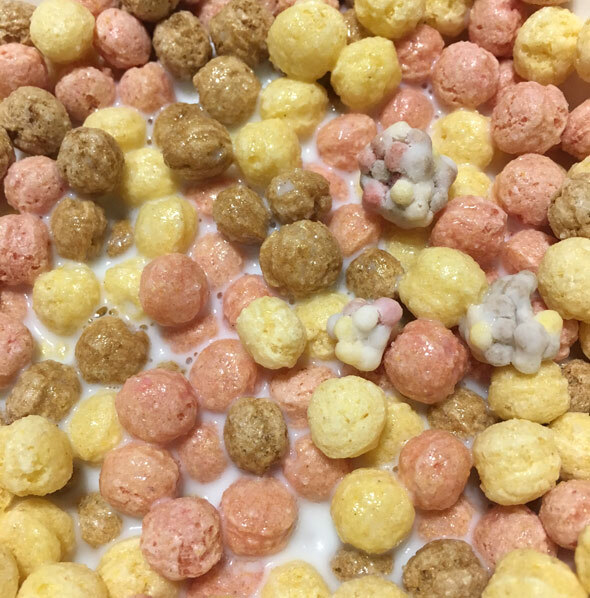 Alongside the round puffs are "banana split flavored clusters" which are made up of tightly stuck together micro sugar balls which look somewhat like Dippin' Dots flash-frozen ice cream treats. When eaten dry, the round puffs all taste the same: sweet corn puff flavor with an essence of artificial banana. The clusters are very sweet by comparison. They are softer than the main pieces and have a sort of cool, ice cream reminiscent feel when eaten in the same bite as the crunchier pieces. In milk, the cereal stays mildly crunchy for about 6 minutes. 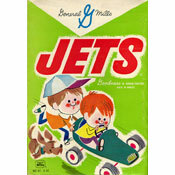 The overall flavor of the cereal is fruity, but not like fruit. It tastes more like Laffy Taffy or other fruit flavored candies. The milk left at the end of bowl tasted quite a bit like whipped cream and might remind some of melted ice cream. Spoonfuls with clusters are the best spoonfuls. In those bites, the cereal comes together and a hint of vanilla becomes noticeable which makes this new cereal taste distinct. But here's the problem... Those cute little clusters are mostly MIA. The first bowl of the cereal I poured had maybe 5 clusters. I'd be surprised if there was more than 40 in the entire box. Overall, this cereal was fine. In some bites, it tasted like something new and interesting. Sadly, those bites didn't come often enough. Dippin' Dots Banana Split cereal would also benefit from a more authentic fruit flavor and some chocolate flavor of which there was none. My 4-year-old girl reviewed the cereal with a thumbs-up and said it tasted "suprising". 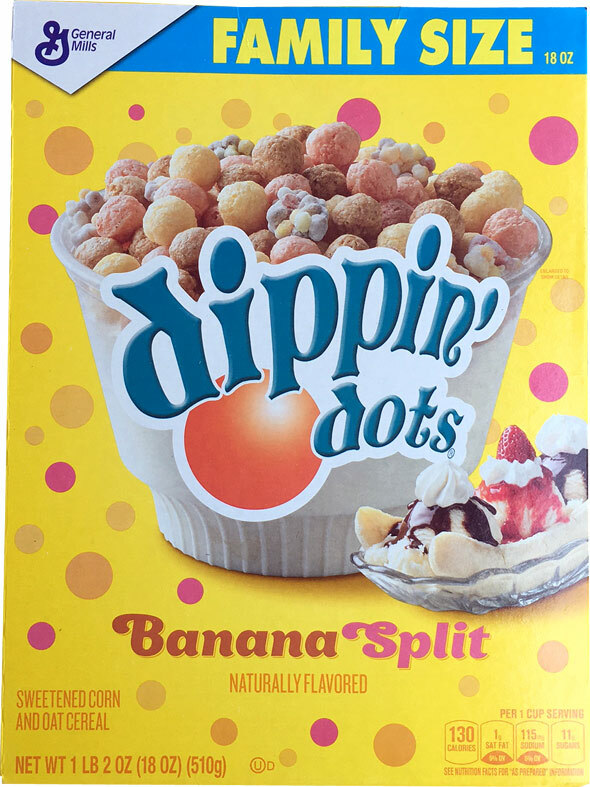 Each 1 cup serving of Dippin' Dots Banana Split cereal has 130 calories, 2.5 grams of fat (1 gram saturated and 0 grams trans), 0 mg cholesterol, 115 mg sodium, 27 grams total carbs, 1 gram dietary fiber, 11 grams sugar and 2 grams protein. 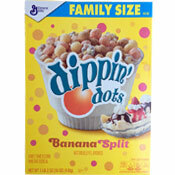 What do you think of Dippin' Dots Banana Split Cereal? I haven't tried it, but when I was told of it, I knew I had to try it! It was really shocking and full of pops, according to my friend.